“All politics is local” was a sentiment offered up by former Speaker of the House Thomas “Tip” O’Neil. The idea is that even on the large stage of national politics, one must think of how decisions affect people locally. To illustrate, let us talk about for a moment a small town in Florida – our home town. With a population of around 10,000, the town suffers from an identity crisis of sorts. Too big to be a “small town” and not big enough to be a “big city,” the town and its citizens are a good mix of blue and white collar workers who generally look out for each other. In short, it is a nice place to live. Unfortunately, there are people that get elected that want to transform the city into what they believe the city should be. Such a vision involves money – taxpayer money. For example, the city council decided to make it mandatory for all commercial businesses having signs along a street had to change to so called “monument signs.” No longer would signs on a pole or other supports be allowed. The only types of signs permitted would be in massive concrete and brick “monuments.” (Think cemetery headstones on steroids.) The cost for the new monument signs was split between the owner of the store and city money, part of which was obtained through a grant from the Federal Department of Transportation. In a depressed economy, the city mandated spending taxpayer dollars and revenues from stores to go to new signage. As far as we can determine, in the last year any proposal requiring the expenditure of money from the city has been passed. Not surprisingly, the city finds itself in financial trouble. There seem to be but two options – cut spending or increase taxes. Increasing taxes is not popular as people have seen their home values and incomes drop over the past years. That leaves spending cuts. One of the things being looked at is the services of the fire department and the police. The town does not have much crime, and in fact in the last 23 years, there has been one killing, and that happened last year. In town meetings, the suggestion has been made to look into ways to improve efficiency in the departments. That was turned down by the council. Not only was examining the efficiency of the departments turned down, when one of the city’s fire engine’s motors broke a crankshaft costing an estimated $35,000, the city council voted into looking at purchasing a new extension truck in cooperation with the surrounding county. Cost of the truck? $775,000 dollars. Cost to the city? $425,000. In a city that is looking for ways to pay bills, instead of fixing a truck for $35,000, the city council wants to pay $425,000 for a new toy. After all…. it is shiny. 2) A neighbor had a heart attack. Response: 5 police cars, 2 fire trucks, 1 set of paramedics, 1 fire chief in his own vehicle, a police supervisor in a Chevy Suburban SUV and the county amublance. 3) A small, smoldering grass fire. Size of the fire: less than a yard in diameter. Response: 3 fire trucks, paramedics and three police cars. 4) The neighbor with the heart attack passed away and was found dead in his home. Response: 6 police, 3 fire trucks, 1 paramedic team. In case you are counting, that is 4 incidents in which 37 city and county vehicles responded. And of course, the city defends the response. How? Because while there were in fact only 4 calls, the city can count each unit as responding to a call. In other words, the city did not respond to 4 calls, it made 37 responses to calls. As for manpower, that is a little more complicated because of state requirements. In 1997, OSHA recommended what became known as the “2 in, 2 out” rule for firefighters. The rule relied upon input from firefighters so that if firefighters came to a structure fire and the fire was beyond the “infancy” stage resulting in the structure was burning, no firefighter could enter the building until there were 4 firefighters on the scene. Of the 4, only 2 could enter the structure and 2 served as backups in case something happened to the other firefighters inside the structure. If the 2 inside came out, then and only then could the other 2 firefighters enter the building. The basic gist was that fire departments always had to have 2 firefighters outside of the structure. The rule meant more safety for the firefighters, but also resulted in more firefighters needing to be hired. The state of Florida passed the OSHA recommendation into law in 2005. So when the 4 incidents above occurred the the first 2 firetrucks had 4 firefighters on them. The third truck, when dispatched, “only” had 2 firefighters. So for the dead body call, there were 18 people dispatched to the scene. Eighteen people all of whom needed to be paid, given benefits, etc. and all costing the city and taxpayers money. 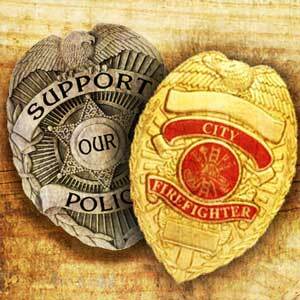 This is not to say that we don’t appreciate the fire department or the police department. That is not true. What we don’t appreciate is the self serving rules and reporting methods. We don’t appreciate the fire department and police being political golden children that cannot be touched or examined. That is a valid sentiment. But can anyone here justify the 18 city employees and their accompanying 10 vehicles for a dead body? This local example is typical of governmental employees at every level. In order to justify their existence employees and unions will generate “facts and figures” based on performance and reporting models that would never pass muster in the real world. That way, when they go back to the people who dole out the money, they can say “look at all we have done!” when in fact the amount of work is relatively small. But they don’t want you to know that because they aren’t competing in a free market. Government markets and services are set by the government, and do not face competition. The lack of realistic use of manpower is not just local here in our town, it is at the county, state and federal level. The men and women who make the decisions for massive programs with little oversight learned their craft at the local levels. All politics, and therefore all waste, is local.